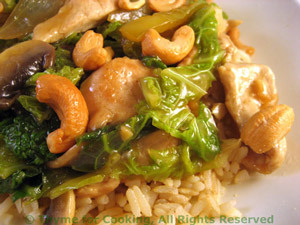 Stir-Fried Turkey, Savoy Cabbage, Cashews, Thyme for Cooking easy dinners. Slice the celery at an angle. Add onion, celery, mushrooms to skillet and stir-fry for 2 minutes. Add sesame oil, soy sauce to pan and heat. Add turkey and stir-fry 3 - 5 minutes, until golden. Remove and put with onions. Add cabbage, pepper to skillet and stir-fry 5 minutes. Return turkey, onions, celery, mushrooms, garlic and ginger to pan. Add chicken stock, sherry, peanut butter and bring to a boil. Cover, reduce heat and simmer for 3 minutes. Uncover, add cornstarch mixture and stir until thickened. Arrange rice on a small platter. Spoon turkey and vegetables into the center, sprinkle with cashews and serve, adding more soy sauce if desired.